Beware! Eseutil is a dangerous tool in the wrong hands. Consequently I recommend that you practice on a test Exchange Server, or else begin with an innocuous switch such as eseutil /mh. Here is a tool that manipulates the Extensible Storage Engine (ESE). ESEutil is a similar to NTDSutil, which I use to configure Active Directory. The capitization reminds me of the ‘util’ part of the word, and this produces a vision of a Suisse army knife (see picture right). Whether you spell it ESEutil, Eseutil or plain eseutil, this built-in executable is three tools in one. A different switch controls each aspect of eseutil, furthermore, eseutil’s switches are also case insensitive. The first, and harmless aspect of eseutil, is illustrated by using the /k, and /mh switches. These commands give us the ability to replay actions that occur naturally on an Exchange 2010 server, for example, if you need to replay the logs after a backup, or you need to remount a store. The second side of eseutil is to defragment Exchange 2010’s databases, for this job use the eseutil /d switch. This purpose of the /d switch is to shrink the .edb files and thus reclaim disk space. However, eseutil /d carries out a specialist database compaction, which is not the same as a Windows Server 2008 disk defragmenter. The third, and the most risky facet of using eseutil, is the repair function, which you execute with the /r or /p switch. I must emphasise that if you need to repair a damaged Exchange mailstore, then eseutil /r or /p should be your last resort. If the database repair fails then it can corrupt the messages in your store, therefore, always backup your Exchange 2010 server before you try the /r or /p switches. If you are new to Eseutil, go to the command prompt and then navigate to the Program Files\Microsoft\Exchange Server\Bin folder. (See screenshot) Since this \bin folder is not in the file ‘Path’, beware of the infamous: ‘not recognised as an internal or external command’ error message. 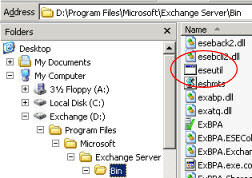 This does not necessarily mean there is no eseutil on the Exchange server, merely that you are not executing the eseutil command from the Exchange Server\Bin folder. Research by using eseutil /? Alternatively, if you are going do a lot of command line troubleshooting, then it’s worth appending the Path in the System Icon, Environmental Variables. A new development in Exchange is that you can use eseutil 2010 not only on Mailbox servers, but also on the Hub Transport and Edge servers. The eseutil /m mode does not repair any of your Exchange files. Its main purpose is to provide you with information about the state of the database files. In particular to analyse a repair of the Exchange database file using the /p switch. However, I recommend that you start with this command to get a feel of eseutil database management ability. Here is a simple switch to verify the state of an Exchange database. All that eseutil /mh does is to determine whether the last shutdown was clean or dirty. Eseutil /mh is also ideal to practice getting to the right path and executing eseutil without doing any harm to the mailstore databases. eseutil /mh "D:\Program Files\Microsoft\Exchange Server\Mailbox\First Storage Group\Mailbox Database.edb"
Examine the output for this line, ‘State: Clean Shutdown’ (or Dirty Shutdown). In passing, you can also see when the last backup occurred. Provides header information about the checkpoint file. Handy for troubleshooting backup / restore problems. One scenario for Eseutil /k is to check a backup before you restore. The key verb is ‘to check’, while the key noun is ‘header’. Just as checksum verifies a file’s size, so by using eseutil /k you can verify the integrity of Exchange 2010’s information stores. Another job for eseutil /k is to troubleshoot an Exchange 2010 database after an unscheduled shutdown of the Windows 2010 server. One point to note is that eseutil /k does not recover the database, for that you need the /r or /p switch – but be careful. eseutil /k "c: \Program Files\Microsoft\Exchange Server\Mailbox\abc Storage Group\Mailbox Database.edb"
(I assumed that Exchange 2010 has been installed on the c:\). You can also run checksum against a database on a transport server queue. By default, the database file name is mail.que. Incidentally the CHKSGFILES Library programmatically verifies the integrity of the Exchange Server 2010 and database and log files. Eseutil /d is probably the commonest, and possibly the safest of eseutil’s switches. Firstly, think of ‘d’ for eseutil database. Secondly, realise that this /d switch works in the same way that Diskkeeper defrags a physical disk. Take the problem where Exchange’s mailstore is huge and does not shrink even after you have deleted several mailboxes. You would like to recover the space occupied by the deleted mailboxes. Thus logon as a local administrator and run: eseutil /d. To prepare for eseutil /d, make sure that you have plenty of free disk space, at least as much as the database file that you wish eseutil to defrag. There is no need to stop the Information Store service, just dismount the individual stores in the Exchange Management Console, then right-click the store and select ‘Dismount Database’. dismount-Database -identity "Worcester\First Storage Group\Your Database"
If you really do not have enough free space try the Eseutil /d /t "f:\temp.edb". Where the f drive has enough free space. Take a reading of the store size before and after running eseutil /d. Naturally, remember to remount the store once the defrag has finished. The defrag procedure for a Hub Transport or Edge Transport server is slightly different. As a preliminary step dismount the Queue database. Navigate to the operating system’s Services snap-in, stop the Microsoft Exchange Transport Service. Now set eseutil /d on to the database. See Eseutil commands in Exchange 2007. In troubleshooting when you force the ESE engine to replay the transaction logs, this is know as a hard recovery; hence Eseutil /r. Soft recovery replays the logs – but only those after the last checkpoint. If a the Mailbox database is dismounted or stopped, then the logs pile up. One such soft recovery scenario could be a sudden ‘dirty’ store shutdown, which resulted in transactions being interrupted. Once that Mailbox store is started again, uncommitted transactions in those logs are written to the database. Also remounting the store triggers a built-in soft recovery routine. With a soft recovery, Exchange processes a few recent transactions after the last checkpoint. Soft recovery reads pointers in E00.chk, from this information it knows which transactions to commit or roll-back in order to get the database into a consistent state. Do not run /r just for fun or merely to see what happens, eseutil /r is strictly an emergency measure when all else has failed to get the server working. However if you have restored an Exchange 2010 database but you cannot mount the store then consider Eseutil /r. Firstly, make the best of a bad situation and backup the Exchange database as it is NOW. Then navigate to the folder containing the transaction logs, now try: eseutil /r e00 /i . Note the sequence /r e00 /i is correct. This assumes that your first, or base log is e00 not some other number. If you have a storage group with multiple stores, I am afraid that you have to dismount all stores before running the /r switch. Perhaps this reminds you that all members of a storage group share the same transaction log. Scenario. You need to recover a store.edb database, you tried the last backup, but that was no good. Perhaps the root cause is the corresponding transaction logs are missing. You may see the error message: ‘The database files in this storage are inconsistent’. Next step, gather more information try eseutil /mh. You determine that the state is inconsistent, after backing up the current database, try eseutil /p. Follow up you repair of the database with Eseutil /d. This not only defrags but also rebuilds indexes. Finally switch to the Isinteg.exe utility and try: isinteg -fix. This Information Store Integrity Checker can repair the database at the application level. Another spiteful problem is that you cannot backup the store. Perhaps the root case was a hardware malfunction. As a last ditch measure, you could try using eseutil /p. I was going to say backup before you try, but of course, in this instance, backup is the problem! How about a little lateral thinking and try to copy the store before you run eseutil /p. In Exchange 2010 Eseutil /p can also repair the transport queue database on the Hub server. The purpose of the /cc in Exchange 2003 was to force the ESE engine to replay the log files. In Exchange 2010 server, this capability has been superseded by LLR (Lost Log Resilience). The built-in LLR feature which protects Exchange databases from losing the most recent log files. LLR is most important when CCR (Cluster Continuous Replication) is in use. Eseutil /cc gets the restored database up-to-date through a hard recovery process. Hard recovery replays the transaction logs after a backup, either select the ‘Last Backup Set’ checkbox, or use eseutil /cc. Remember that eseutil /cc looks for instructions in the Restore.env file. Perhaps you can see what I mean when I say that some aspects of Eseutil are just command line methods of controlling Exchange 2010. If you delve more deeply, you find that eseutil /c has a whole family of commands e.g. cc /ch. This error indicates physical to a transaction log file. Error -501 is similar to error -1018 in a database file. Unfortunately, there is not much you can o to repair the log file. The most likely reason is the log file is missing. Another error message I received, but in this case I could not find the root cause. Suspect missing log files. 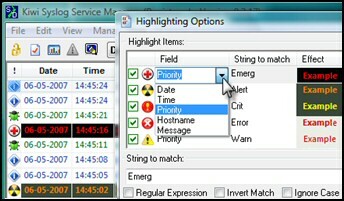 This utility executes a set of pre-determined troubleshooting steps to identify Exchange 2010 database problems, for example inconsistency on the log files. Then magically wizards appear to guide you to solutions for the root cause, such as running one of the above Eseutil switches. This utility is a son of ExTRA (Exchange Troubleshooting Assistant). It calls for built-in routines to identify the reasons why the ESE engine cannot mount the Exchange 2010 database. Drill down to the Toolbox folder. Eseutil /? The best way to learn more about these Eseutil switches. Eseutil /a (New switch for Exchange 2010) LLR replays logs. Eseutil /y Copies a database, or log file. Eseutil is a powerful command-line utility. It has at least three jobs, defragging stores, checking the .edb database files and repairing corrupted mailbox files or logs. My advice is to practice with the /mh switch before you have to use the eseutil /r (repair) switch on a live network.